Here are the basic models. You can also check out the other variations of the division model . 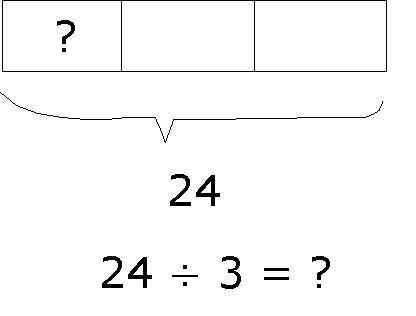 To divide 24 by 3, draw 3 boxes to represent 3 groups and put 24 as the number to represent to total for the 3 groups. For this model, there are a few ways to draw it. They are presented below. You may choose the one that you like most. From the model, we arrived at the conclusion that the unknown value (?) can be calculated by dividing the total (24) by 3 boxes (which represents 3 groups. 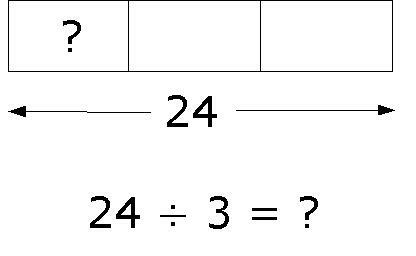 Hence, we formulate the number sentence ======> 24 ÷ 3 = ? Other ways to draw the divide model are presented below.